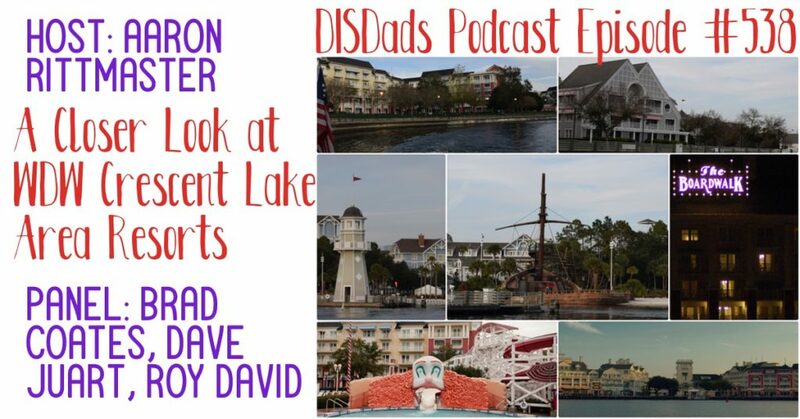 Host Aaron Rittmaster and the DISDads Podcast panel dig into the Crescent Lake Area Resorts at Walt Disney World as a group for the first time in more than five years. (Last time was in March of 2012, back in Episode 26). We discuss all aspects of these resorts, both their positive and negative points, and spend some time talking about which of these resorts is the best fit for a few different traveller profiles. Which is your favorite Crescent Lake Area Resort at Walt Disney World? Do you agree with the panel’s assessments? What did they get wrong? Tell us about it! If you enjoyed the podcast, we’d also really appreciate it if you took a moment to leave us a review on iTunes (If you didn’t enjoy the show, feel free to ignore that last link). Big thanks and a shoutout to Kraig from Brooklyn for his kind review earlier this month.